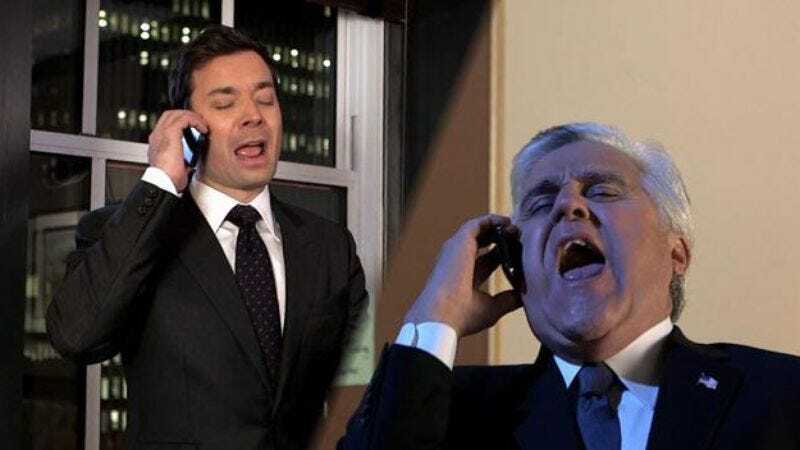 Confirming weeks of rumors and song parodies, NBC has officially announced that Jay Leno will step down as host of The Tonight Show in the spring of 2014, handing the job to Jimmy Fallon. Also as expected, the change in leadership will see a change in producer, with Lorne Michaels now at the helm, and location, as Tonight returns to its former home at New York’s 30 Rockefeller Center, hopefully not disturbing the bones of Steve Allen and Jack Paar that are buried there. No announcement has been made regarding Seth Meyers taking over Late Night from Fallon, though that still seems to be the plan. Meanwhile, NBC said some stuff about Leno being an “entertainment icon” and paying testament to his high ratings that nevertheless were not enough to warrant keeping him around, and Leno issued a statement congratulating Fallon, saying, “I hope you're as lucky as me and hold on to the job until you're the old guy.” And then, perhaps, until you’re the old guy who’s being pushed out by the younger guy, who then weasels his way into pushing the younger guy back out, only to have an even younger guy push you out for good.